"Welcome to our Wonderful World of Westies!" "The Renaissance Dog" © 2002 Chet Jezierski, used with the permission of the artist. As I write this message, the Premium List for the Roving is being mailed to our membership. If you have not yet made your plans for the Roving at Purina Farms in St. Louis, Missouri, from May 30 thru June 3rd, now would be the time! Purina Farms is 35 miles from St. Louis International (Lambert Airport). The host hotel is the Holiday Inn Saint Louis West at Six Flags – 4901 Six Flags Road, Eureka, Missouri 63025. Reservations are best made by calling the hotel directly at (636) 938-6661. 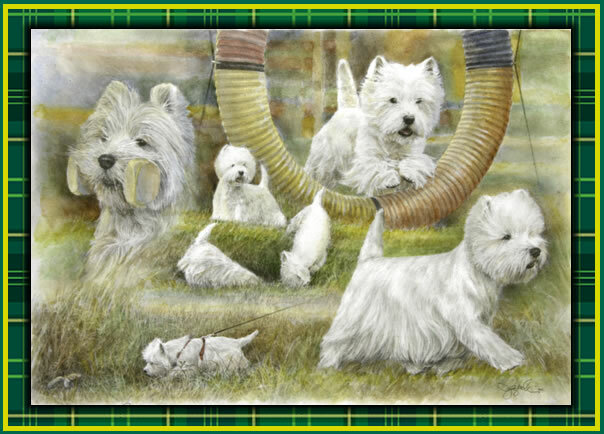 The reservation code is "West Highland White Terrier". There is a one-time, non-refundable show fee of $35 and the room rate for either a king or two queen beds, is $129.95 a night, plus tax. There is no pet fee; however, dogs are limited to 4 per room. In case you haven't noticed, our Performance Committee has been hard at work. In January, PACC updated and received approval for its revised Performance and Companion Events Rules. With the increasing number of events available for our White Dog Nation, comes the task to keep current on the expanding opportunities to title your Westie and gain points toward Versatile Dog Awards. If you have never worked on an oversight committee, then you may not know the many, many hours and countless telephone conferences required to stay current on our rules and approved events. The new Versatile Dog Award point system [is] available on our club web site. Hats off to our PACC members, Susan Chapman, Sil Sanders, Lorraine Pelter, Karen Shinoda, Angie Jennings and Marie Holman. Be well. And I hope to see you all at the Roving!